To be successful at content marketing for your educational institution, you’ve got to publish a lot of quality content regularly. For best results, you should create original content as much as possible. 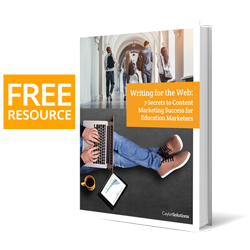 However, many education marketing departments just don’t have the resources to create the large volume of original content necessary for content marketing to work. Content curation is like art curation. The content marketer searches all media outlets for content related to their industry and relevant to their audience. Once you have the content you know will serve your audience well and align with your content marketing goals, you need to modify the content so that it reflects your education brand’s value proposition or point of view. It’s not entirely original, but it’s certainly not plagiarism! Content curation has a very practical advantage. It gives you more content you can publish because you don’t have to come up with every topic that could be relevant to your audience. But there’s an even more strategic advantage to curating quality content. Content curation shows your audience that your education brand speaks with authority in the conversations that are happening in your audience’s world. That means you’re showing your education brand’s authority by displaying the thoughts of others (sometimes even your competitors) and answering with your brand’s perspective. So how do you curate content? If you consider the millions of content producers on the Internet, curating content can feel like drinking the ocean. But the reality is that you wouldn’t really use the content that most Internet sources would publish. It’s far more likely that you’ll have a list of ten to as high as thirty content sources that match your target audiences, produce content that you trust, and are relevant to the concerns of enrollment marketing. Yet even then, do you have time to go to each website and check to see if they’ve published a new article, blog, or video? And I’m really not a fan of signing up for all of their newsletters (although you can certainly do that). That’s why I recommend that enrollment marketers use feed readers like Feedly, The Old Reader, or Inoreader. Feed readers aggregate the latest content from the sources you choose using technology called RSS (Really Simple Syndication). Feed readers like Feedly make content curation much easier for enrollment and education marketing. Each time one of your sources publishes a new piece of content, your feed reader receives it and shows you the whole article or a summary. By the way, feed readers are not the same as news aggregators like Apple News or Microsoft News. News aggregators curate content they think you’ll like from sources they know and trust. On the other hand, feed readers receive and show you all the new articles from the sources that you’ve already chosen. That means you’ve curated the sources you want, so now all you need to do is curate the content pieces that come to you from your chosen sources. Now that you’ve got the tools to almost completely automate curation, what content should you be curating for your marketing personas? Education marketers should aggregate the various content being published across the school’s departments or programs. In any independent school, private college, or university, there are multiple departments or programs in the school that will be creating content for your target audiences. Therefore, the first place you should look when curating content for your education brand are the content pieces your school is producing. Find out which departments of your educational institution are producing and publishing content. For smaller institutions, this may be as quick as jotting them all down from memory. But if you’re a larger institution with any kind of history, you’ll need to ask around in meetings or around the water cooler to find out which teams or departments have a process of publishing news content. Collect the URL’s of the blogs, sign up for their email newsletters, or follow their social media platforms to keep up with all the latest news from your fellow departments. Then, distribute their news through your marketing channels. It’s very likely that you have staff or faculty who are publishing content somewhere. Again, ask around and find out where your on campus “experts” are publishing their latest thoughts, aggregate their content as we’ve already discussed, and then distribute their content on your marketing channels. Just remember, you should include your education brand’s point of view when you redistribute their content. Even though they are staff, it’s still their content unless it was published by the school. So be careful not to plagiarize. Many prospective students and their families are highly interested in your school’s sports program. Find out where your sports program publishes its news, aggregate their content, and republish it on your channels. Alumni development departments or associations do a great job of creating content to cultivate relationships with your school’s alumni. This is a great place to find content that would be interesting to your other marketing personas! Finances are among the top concerns of most prospective students. Curated content from scholarship sources like private trusts and foundations or even government scholarship or grant sources will be a big attraction for your education marketing audiences. Every now and then, news or developments that interest us in the education space can interest prospective students. But be cautious with this one! Students and their families don’t care much about the inner workings of the education sector. If you curate too much of this content, you’ll likely bore your audiences. Psychology content producers often write pieces about how children grow or how to best guide your student as they mature and develop as a human being. These kinds of pieces are content gold for the parents you want to motivate towards choosing your school. When it comes to the prospective students themselves, they’ll be very interested in any content that shows them principles, hacks, or new insights into how they can be a better student or get better grades. Content from trusted sources relating to career development will ring true with older prospective students looking to come back to school. Popular sources like Forbes are a great place to find good articles in this area. One of the reasons I love working with private colleges, universities, and independent schools is because of the variety. Private education is all about customization! There are private institutions that have innovative programs in environmental studies, outdoor recreational leadership, ministerial training, and many more. So I recommend you curate content related to the specific area that your school specializes in. Bible schools should curate content from pastoral, church, or religious news sites. If leadership is a big part of your brand, then hunt for content wrapped around leadership. If the environment is what you’re all about, then curate content related to environmental issues and breakthroughs. Although the content you curate will not always relate to the specific details of enrolling at your school, it will establish your school’s authority in the areas your brand wants to speak into.